Under 10, in Six Hundred Ten (60010) – Write with us! It seems to be an unpopular question with young people right about now. It’s just part of growing up, but you try to keep it out of your mind as long as possible. Especially in the summer months of June through August. But I have to ask. It’s just that time of the year. “Are you ready to go back to school?” Whew! Ok, I asked. But in order for TT Patton to get ready with back to school supplies, we have to start buying now. This year I want young people to know that pens and notebooks don’t have to be boring. You can write with fountain pens, saving the planet with every stroke by simply adding ink cartridges instead of throwing out empty ball point pens. So this year I brought in a really cool line called Preppy. 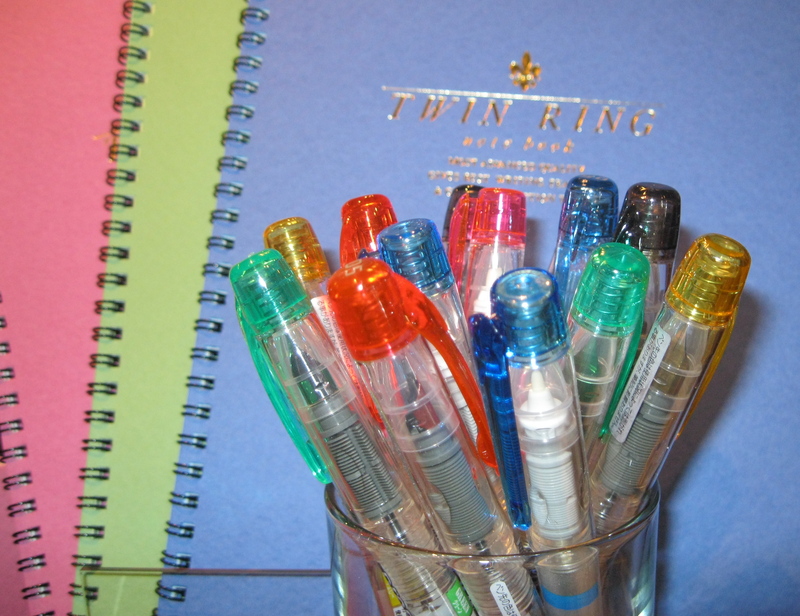 At just $6 per fountain pen, they’ve become a big hit with our students in the Creative Writing Summer Camp. They come in 6 colors, and they use cartridges for ink, which makes them refillable. How can you beat that? The Preppy Pen also comes in a highlighter, for $6…. and they’re refillable too. How can you beat that? Matching spiral notebooks, indexed with smooth lined pages. I can’t give away all the hints of cool stuff we have planned for Back to School, just know there’s more to come. Selecting Back to School supplies is my summer project. So how can you help with my summer project? Shop Sidewalk Days in Barrington, July 29th-July 31st and you’ll help make space in the shop for all the new items. And since we’re making space for the new stuff inside, everything outside will be “Under $10.” I know….. But don’t stop there, walk inside and find other bargains like free return addressing on personalized stationery and preview many fall items, like Filofax planners. What’s in it for you? In addition to all the bargains, the Barrington Chamber of Commerce and TT Patton are sponsoring a FREE 60010 Coupon Book filled with discounts from local merchants and businesses. You can pick up one at The Chamber Information Booth during Sidewalk Days located at McGonigal’s Pub or at TT Patton at our “Under $10” table set up outside our shop. Yes you heard it right, under 10 in six hundred ten (60010).